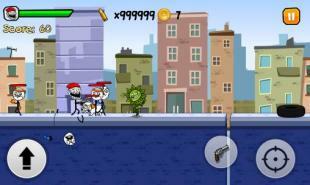 Run like troll 3: City hunter - guide the stickman along city streets full of stickman zombies. Shoot monsters from different weapons. The hero of this game for Android was in the city, which is infected with a virus, has transformed citizens into zombies. 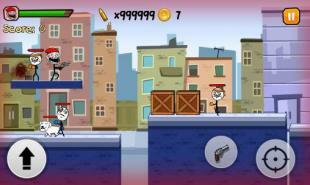 Help the hero protect yourself from zombies. Guide him on. Make dizzying jumps along platforms. Overcome obstacles and traps. Keep firing your pistol, shotgun, machine gun, or other weapons. Collect gold coins to buy and improve weapons. Unlock new levels.